Looking for an adidas student discount? Well Student Discount Squirrel can help. Currently there is a Adidas student discount code to get 50% off sale items, an additional 10% off the top of that and 25% off full priced items on adidas.co.uk in 2019. To get the code, validate your student id here with Unidays and you can generate a unique promo code. The savings don’t end there. Next, take a look at our savings section below for further great ways that could help students save even more money! Adidas is one of the premier sports brands on the earth. From predator football boots to Stan Smith and Superstar trainers and their fantastic retro sportswear, adidas has it all. While quality sportswear comes at a price, the Student Squirrel is here to show you how you can save money on your purchase. We know that the results can be confusing on Google, we’re here to make things clear with this comprehensive adidas student discount guide. Is there a adidas NUS, Unidays or Student Beans Discount? There’s lots of different results when you try to look for student discounts in general and there are lots of different cards, websites and schemes offering different reductions with different brands including adidas. Never fear though, the mighty Squirrel is here to explain all and run you through the various options. Fab news. There is an adidas student discount code which entitles you to get 15% off all full priced items. Sometimes the discount is increased and we have seen it as high as 25% so make sure you look out for then. Go to this special page on adidas.co.uk and make your purchases. Head to UNiDAYS and verify your student status and you’ll be issued with a voucher code. At the online checkout enter the code. Laugh all the way to the union bar and buy your mates a round (this is optional). HOWEVER, did you know that there are extra ways that you can save even more? Head to the adidas outlet where there are reductions of 50% on selected lines and some times more. 2. Is there a adidas NUS discount, UNiDAYS or Student Beans discount? As the student discount market is quite dispersed in the UK it can be confusing to find out exactly what student discounts avid learners are entitled to. The 3 biggest ones are NUS, UNiDAYS and Student Beans and each of them have a different offering. We get asked a lot whether there is a adidas student discount through these schemes so we’ve done some extensive researching so we can answer your questions properly! 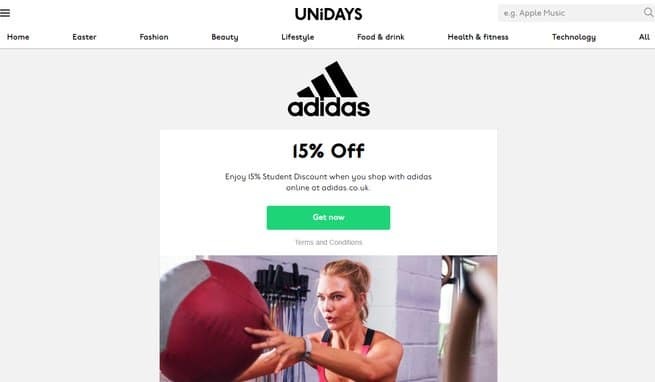 So the fab news is that there is a adidas UNiDAYS student discount. To get it you need go to this page on adidas.co.uk, put your awesome football boots, trainers or sports clothing in your basket, then get verified with UNiDAYS are you’ll be issued with a student voucher code to enter at the checkout and bob’s your uncle you’ll get a terrific 15% reduction on all full priced items. So this is a tad confusing so bear with us. There is no NUS adidas scheme at the moment for students to save. This includes not being included in the NUS Extra card scheme. HOWEVER, NUS students can still get an adidas discount through the UNiDAYS scheme and get the voucher. Read the first section for full details on how to get it. Plus make sure you check out our savings section to see the latest ways that you can save and any available promo codes that could save you even more. Nope, there is no association between Student Beans and adidas. This would make things easier for students, but you can still get the 15% promo code for free through UNiDAYS. Make sure though that you do check out the adidas outlet page too as there are bigger discounts there to be had. The adidas savings don’t stop there though students. Read on to get some more excellent savings tips! So first of all, just to reiterate, there is a 15% adidas student discount code which is valid off all full priced items including trainers, predators, Stan Smiths, Superstars and clothing. To get it check out our savings section. However, adidas sometimes release general voucher codes that anyone can use, you don’t have to verify your univeristy, school or college status and makes saving all the easier which we love here at Student Squirrel. We list all current general discount codes at the op of the page in the savings section so make sure you take a look. So unfortunately there isn’t a Adidas student discount NUS code, but there are short term promo codes that this fantastic card maker releases every so often. Take a look at our which will list them all there. Using the codes are easy, just do your shop on adidas.co.uk, get to the check-out and enter the code and the relevant reduction or offer will automatically be applied. Now we’ve established that there is a 15% adidas discount for students, but this is for full priced items only. Did you know one of the best ways to save is when there is a big adidas sale on. We keep our squirrel eyes open so any big sales will be in our fabulous savings section. Take a look and see how much you can save. Adidas go big on Black Friday and Cyber Monday and usually release a voucher code to get 30% off everything. This is double the normal student discount so is really worth waiting for. There are some big sales on around Christmas. Usually they start a couple of days before the 25th, then on Boxing Day there are further reductions and even bigger ones nearer New Year and January. We recommend that if there is something you want then get it as soon as it’s in the sale as it might sell out. Around mid March adidas have a mid-season sale and also something for Easter too. Around the beginning to mid June adidas has a big summer sale. There are some big reductions and they include a lot of stock so we like this a lot. They also at some point introduce an extra 20% off promo code which is a great way for students to save. We also like that they have good search filters to make finding a bargain easy. Sort by discount amount, trainers, clothing and sizes too. Multinational sports giant Adidas is the largest sportswear manufacturer in Europe and the second largest in the world. Headquartered in Herzogenaurach, Germany, the brand manufacture, market and sell a vast range of sports clothing, footwear and equipment. The Adidas Group owns a good chunk of household sportswear and activewear brands, including Reebok, Taylormade and Runtastic. The main focus of Adidas was, for many years, football shoes, clothing and equipment, and the company still own part of the Bayern Munich Football Club in Germany. The company remains a major supplier of football kits and shirts for various league and international clubs, as well as referee kits through many countries and territories. Adidas have been at the forefront of producing football boots for a variety of surface types and competitions and in 1979 released the innovative Copa Mundial moulded boots for matches held on firm dry pitches – which went on to become the best-selling football boot of all time! FIFA have commissioned specially designed footballs for its World Cup tournaments, and Adidas is now an official sponsor of the UEFA Champions League. Football aside, Adidas also offer specialist attire and equipment tailored for basketball, cricket, golf, gymnastics, lacrosse, running, skateboarding, tennis and kabbadi (a non-Olympic contact team sport that’s popular in Asia). There’s also fashion and activewear collections including numerous collaborations with designers and style-conscious celebrities, including Stella McCartney, Rita Ora, Jeremy Scott, Kanye West, Stan Smith and Pharrell Williams. These limited-edition collections often sell out quickly and are usually only available through Adidas retail outlets and online. As well as clothing and sporting equipment, Adidas are well-known for their accessories. These include the currently very popular slider sandals, known as Adilette, which were first designed by the brand over 50 years ago! There’s even a massage-version of the sandals called Santiossage, with small plastic nubs built into the sole for a foot massage as the wearer walks. Other such accessories produced by Adidas include the miCoach fitness app and tracker, a range of shower gels and body lotions, watches, eyewear, sunglasses, bags and socks. 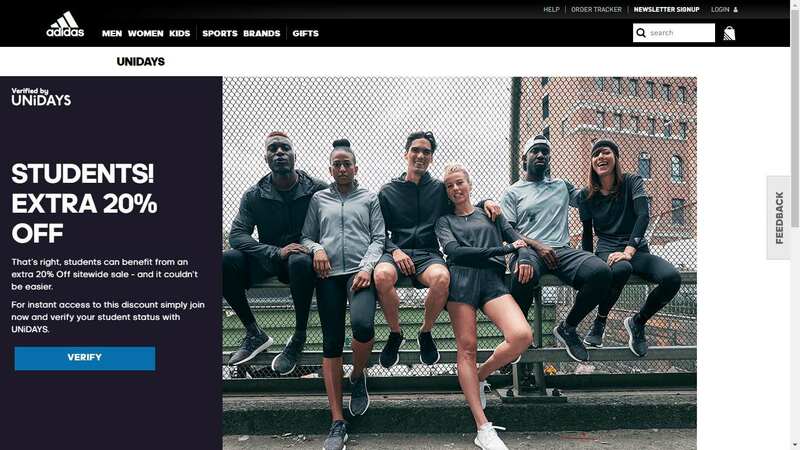 Adidas is in competition with essentially every other major sporting manufacturer but selling through its own website and retail outlets as well as through other distributors gives it wide appeal. The brand also invests heavily in sponsorship deals in sports teams, individual athletes and competitions; spanning football, rugby union, tennis, basketball, hockey, ice hockey and cricket, all across the world. You probably own an Adidas item and even if you’re not a sports or fitness fan, you probably should, as the brand is synonymous with quality and style. The absolute classics and current summer staple, sliders are the comfiest fashion shoe going. Originally designed for athletes in locker rooms to help maintain some comfort and hygiene, they’ve now become a fashion must-have for the beach, swimming, nights out and just doing your normal errands! Adidas sell a range of sliders for women, men and kids, and for all uses, in all colours and styles. Take advantage of this comfort while they’re still considered socially acceptable! Whether you play a sport or just train at a gym, this bag is only the medium option but is easily big enough to fit in everything you need! There’s an adjustable shoulder strap and padded handles to give you different comfy carry options, and there’s detachable inside dividers to separate out and organise your essentials, as well as optional detachable boot bag for your dirty shoes. Despite being made from polyester, all materials used in the production of this bag are entirely recycled and are part of the Adidas Sustainable Product Program. The classic striped socks you’ll see gracing the ankles of everyone all summer, this multi-pack presents great value. The foot-bed is half cushioned for comfort and the blend of cotton, polyester, nylon and elastane gives for great stretch but breathable wear – so no stinky, sweaty feet after a lot of walking, cycling or running! These socks are ribbed and feature the Adidas trefoil logo as well as the classic three stripes; so there’ll be no doubt about who it is you’re wearing. Founded in 1924 by Adolf Dassler following his return from the first World War, Adolf made sports shoes in his mother’s laundry room in his spare time and quickly recruited his brother Rudolf to the business. Originally named The Dassler Brothers Shoe Factory, the pair worked to develop spiked running shoes for athletic events and was the first business to develop pairs with canvas and rubber spikes instead of metal. In 1936, the brothers persuaded US sprinter Jesse Owens to wear a pair of their hand-made spiked shoes at the Olympics that summer; and he won four gold medals! The business’ reputation was elevated and by 1939, the brothers were selling 200,000 pairs of shoes every year. In 1947, the relationship between the brothers broke down completely and they split their business efforts; with Rudolph forming the brand that’s now Puma, and Adolf Adidas. The brands were fiercely competitive over the next few years and several athletes swayed back and forth between their endorsements and sponsorship deals. The three-stripe logo that’s made Adidas into a household brand today wasn’t actually acquired by the company until 1952, when it purchased it from Finnish footwear brand Karhu Sports… and paid 1600 Euros and two bottles of whiskey for it! What a deal. Student Discount Squirrel approves. Adidas’ main competitor now is Nike, but it remains to grow from strength to strength and is an extremely well-respected brand throughout the world for both sports and leisure wear. As you can see there are lots of ways to save with addias however as a leading and favourite brand with students all over the country these sales and offers can be few and far between. We will always update the offers on here and on our social media so keep an eye out there! When buying adidas trainers, football boots or clothing make sure you check out the Sports Direct student discount page. For trainers JD has a great range including Stan Smith and Superstar and a 10% code. Foot Locker of course has a great range too and click and collect. If you fancy something from there big rivals, Nike has a 10% code for students. Footasylum also have a 10% student discount and stock a great range of adidas trainers. It is the largest sportswear manufacture in Europe. The company was started by Adolf Dassler in his mum’s house! The company logo is the very recognisable 3 stripes! The brothers fell out and split and Frederick started his own company which would eventually be known as Puma! Madonna has done promotion for them! Football kits is one of their biggest earners and they have sponsored the world cup football! They sponsor lots of leagues and cups all over the world including baseball, basketball, cricket, golf, lacrosse, running, skateboarding, tennis! They have sponsored major football clubs including Manchester United, Real Madrid and Bayern Munich!